Here’s a photo of Mt. St. Elias, taken from the same flight as my previous 2 posts. 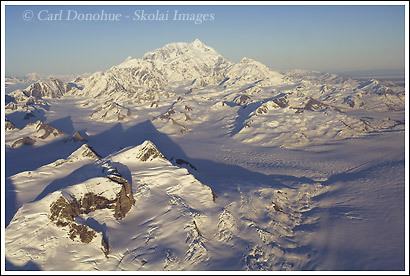 I’ll post a couple more on this series of aerial photos of Wrangell St. Elias National Park over the next few days. Mt. St. Elias stands 18,008 feet (5,489 metres), and rises almost from the coastal shoreline of Taan Fjord in Icy Bay. This proximity to the ocean is one of the reasons the mountain is so rarely climbed, even today – the weather is often extremely adversarial for climbers (and photographers!). Most expeditions take 2 – 3 weeks to summit due the not infrequent storms encountered. Mt. St. Elias also generates the Malaspina Glacier, a 150 sq mile flow of ice that runs from the mountain’s base into the Gulf of Alaska. The St. Elias mountain range is one of the most dramatic in the world, and home to more glaciers and icefields than any other area in North America. The jagged peaks soar skywards like outstretched fingers clutching at the sky. Everywhere snow and ice cover the rock, creating a sea of white. The St. Elias mountain range is home to 19 mountains standing over 14 000′ high, 16 of which are taller than Mt Whitney (the highest peak in the contiguous states of the US), and 13 of which are taller than 15 000′. Mt. St. Elias holds the unique distinction of being the 2nd highest mountain in both the US and Canada – and though in most cases nobody cares for 2nd place, this magnificent mountain is definitely an exception. Mt. St. Elias is also one of the steepest mountains in the world, and comes in a cool Number 10 on the list of Spire Measure (and Number 1 on mountains outside of the Himalayas), which PeakList describe as a measure of how impressive it is to stand at the top of a peak and look down. My number one goal on this trip was to get some nice images of Mt. St. Elias, Mt. Logan, and the St. Elias mountain range. Fortunately the weather was just about perfect, I had a fantastic pilot, as well as a passenger from McCarthy who held the window open for me whenever I wanted to shoot. As a little tip for anyone wanting to do some aerial photography, ask what the cost of having a passenger along is – some companies will let a 2nd person ride cheaply, even free. The other passenger was able to wear thick windproof gloves that kept his hands warm while I operated the camera and shot without gloves on (being sure to keep my hands inside the plane). There’s no way I could’ve done this flying at 100 miles per hour at 12 000′ ASL if I had to hold open the window. The temperatures were down to 20 degrees F, with a 100 mile an hour wind chill factor. Trust me, bring yourself a passenger along for the ride! This year I’m heading back to Wrangell St. Elias National Park with the goal of shooting more landscapes from areas of the park I’ve not visited. I also want to get a few more images of the St. Elias mountain range, including some images from Icy Bay of Mt. St. Elias, towering above the coastal shores. The park is so vast and so incredibly diverse one could photograph it forever and not even scrape the surface of the gems of Wrangell St. Elias National Park. More photos of Wrangell St. Elias. This entry was posted in Aerial Photos, Alaska, Landscapes, Wrangell - St. Elias National Park on April 29, 2007 by Carl D.